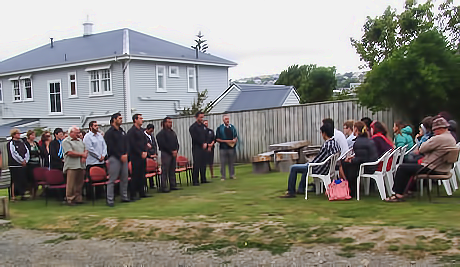 On Monday 11 February, sixty people attended a powhiri in Johnsonville welcoming eight young people into the Marist – Challenge 2000 Gap Year Programme for 2013. Tihei Maihi, a youth worker at Challenge 2000 and Pa Piripi Cody, vicar provincial of the Society of Mary welcomed the Gap students to the Marist – Challenge whanau. In his speech Pa Piripi presented the Marist – Challenge 2000 Gap students with the icon of Mary and Marist Founder, Jean-Claude Colin. “I hope the icon will serve as an inspiration when you find things difficult this year and encourage your to keep going”, Pa Piripi told the Gap students. Eight young people were formally welcomed to the Marist – Challenge 2000 Gap Year Programme, Anya from Tauranga, Anna and Hakaraia from Levin, Siata, Courtney, Damien and Junior from Wellington and Jacob from Dunedin. Hakaraia Jacobs expressed gratitude on behalf of the Gap students and their whanau. The Gap year provides people with an opportunity, for one year, to embark on a journey of development, service and discovery. The Marist – Challenge Gap year programme involves academic study, group work focussing on self-awareness, experiential learning, pastoral service placements, cultural training, retreats, supervision and spiritual direction, involvement in parishes and youth agencies and different modules including sacraments, church history, the Catholic Church in Aotearoa New Zealand, meditation, prayer and being Catholic and Marist today. After the powhiri, Challenge 2000 also took the opportunity to unveil a carving at Dr Taylor Terrace that tells the story of Challenge 2000’s commitment to living the Gospel, emphasising values such as kindness, humility, compasion, justice and gentleness. Welcoming everyone to the unveiling Director of Challenge 2000, Bridget Roche, read the names of four Marists who were added to the carving, Petero Matairatu (Fiji), Kevin Conroy, David Gledhill and Phil Cody. The carving was blessed by Fr Denis O’Hagan, the leader at the Marist spirituality ministry based at Pa Maria.